Duck Sung Ko, M.S., Jae Won Cho, M.S., Hyoung-Song Lee, M.S., Jin Yeong Kim, M.D., Ph.D., Inn Soo Kang, M.D., Ph.D., Kwang Moon Yang, M.D., Ph.D., Chun Kyu Lim, Ph.D.
To investigate the meiotic segregation patterns of cleavage-stage embryos from Robertsonian translocation carriers and aneuploidy of chromosome 18 depending on meiotic segregation patterns. Infertility center and laboratory of reproductive biology and infertility. Sixty-two couples with Robertsonian translocation carriers. One blastomere was biopsied from embryos and diagnosed using FISH. Translocation chromosomes were analyzed using locus-specific and sub-telomeric FISH probes. 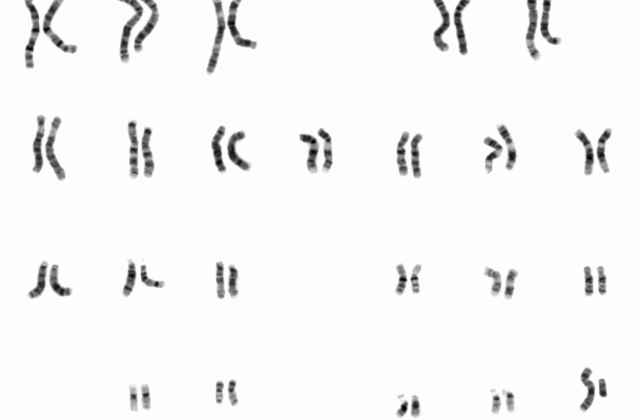 Aneuploidy of chromosome 18 was assessed simultaneous with translocation chromosomes. Two hundred seventy embryos of 332 transferrable embryos were transferred in 113 cycles, and 27 healthy babies were born. The alternate segregation was significantly higher in male carriers than in female carriers (43.9% vs. 29.9%, respectively), and adjacent segregation was higher in female carriers than in male carriers (44.7% vs. 38.7%, respectively). Aneuploidy of chromosome 18 was significantly increased in 3:0- segregated or chaotic embryos. Forty-seven alternate embryos were excluded from embryo replacement due to aneuploidy of chromosome 18. In carriers of Robertsonian translocation, meiotic segregation showed differences between males and females. Frequent meiotic errors caused by premature predivision or non-disjunction and less stringent checkpoint of female might cause such differences between sexes. Aneuploidy of chromosome 18 might be influenced by meiotic segregation of translocation chromosomes. Factors that cause malsegregation such as 3:0 or chaotic segregation seem to play a role in aneuploidy of chromosome 18.